Lieutenant-Commander William ‘Bill’ George Boaks is one of that strange breed. A true eccentric Englishman – not daft, not stupid but a man who followed his convictions in his own style. He fought his first Parliamentary contest in 1951 when he stood for election for Walthamstow East . He polled 174 out of 40,041 votes cast; in 1956 he tried his luck again but this time in Walthamstow West. His total votes cast – 89. His views were not as narrow as that name might appear as you are only allowed six words to describe your political association. He was born in Walthamstow, North London on 25 May 1904 and educated at the Royal Naval College, Greenwich. He joined the Royal Navy at 16 as a sixpence-a-day boy, second class, and rose trough the ranks in 30 years service. His duties ranged from flying training to submarine service, and he was awarded the DSC after his destroyer was sunk. He was a gunnery officer at the sinking of the Bismark. 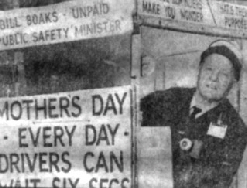 He is pictured above in his ‘campaign bus’. It was actually a 140lb armoured bicycle hung with road safety and other posters that cleverly concealed an iron bedstead. Road safety was central to his beliefs. He kept a pram loaded down with bricks which he would push on to pedestrian crossings in front of rapidly braking motorists. It was a source of some interest to veterans of elections and electioneering as to why Bill Boaks continued his long running campaign, certain that he would be well down the list of candidates and invariably lose his deposit. The following quotes may help to understand his motivation and his own Englishness. Sadly for one who dedicated his life to road safety he he was injured in a road accident in Wimbledon in November 1982. It slowed him down and in 1984 he was involved in another minor road accident whilst stepping off a bus. He died on 4th Aril 1986 as a result of complications from the head injury he received in that accident.